Quickly find exactly the text you need, no matter what kind of file it’s in. Preview your results in context. Save your results, so your next search will be even faster. First, choose your search terms. You can search for one or more words, whole phrases, or use regular expressions, like “+cats +dogs” or “+cats -dogs”. Search for UNICODE text, or for special symbols like line breaks. Or, search for special characters by HEX code. Then, choose where you’d like to search. You can search a single folder or a group of folders, on your hard drive or your local network. Include or exclude individual folders from your search. 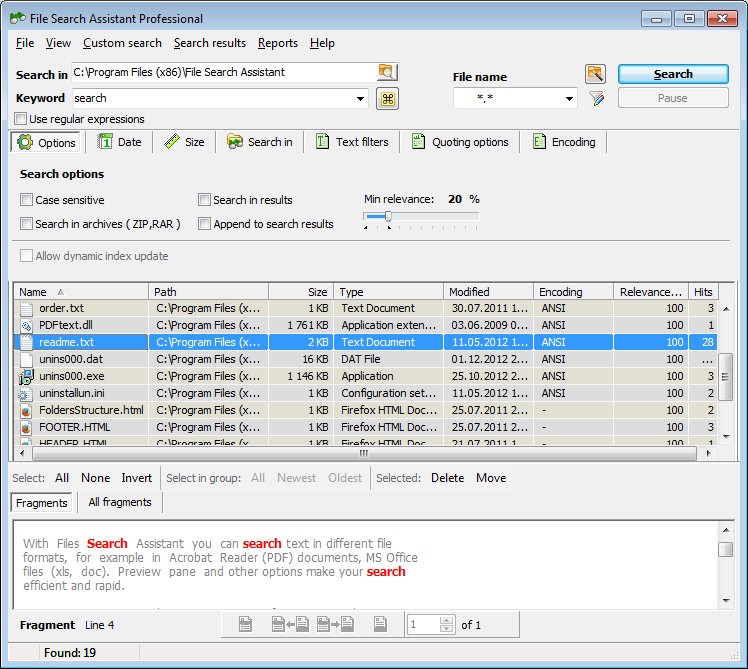 Even filter your search to find files of a particular size, or files that were modified on a particular date. 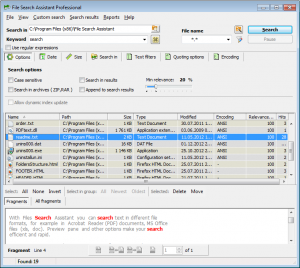 Search all kinds of files, regardless of format or encoding. Of course you can search MS Office documents, like Word documents, Excel spreadsheets, and PowerPoint presentations. But you can also find any matching text in your OpenOffice documents, Adobe PDF documents, RTF (Rich Text Format) documents, and in the text and meta tags on your HTML web pages. Search the tags on your images, videos, and multimedia files, as well. Search password-protected documents. Even search files inside WinZip and WinRAR archives. And Preview your results. File Search Assistant doesn’t just show you a list of your matching files. It shows you a preview of each of those files. You’ll see exactly where your keywords were found. You’ll even see the surrounding text. You can preview one file at a time, or preview all of your search results at once. 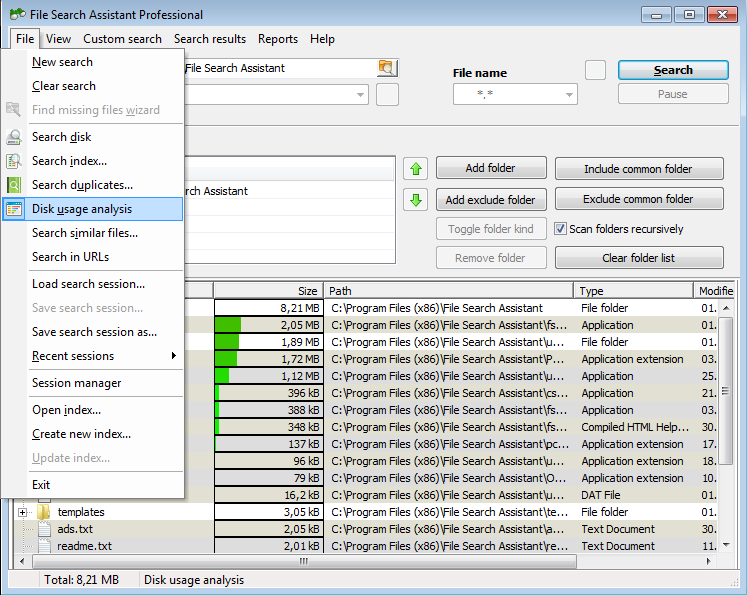 And File Search Assistant also includes several additional features. Index your files, to make your next search even faster. Choose fixed indexing for files on your hard drive, or portable indexing for files on a thumb drive. 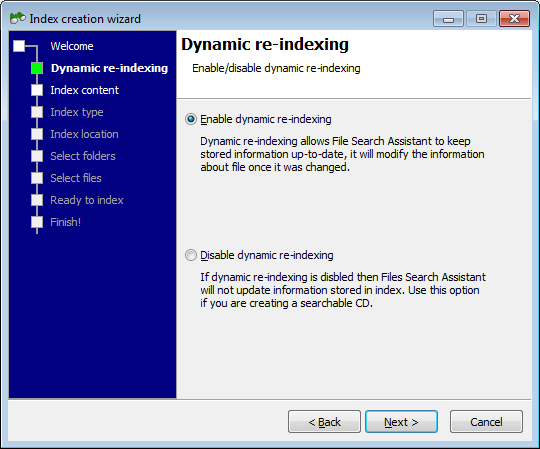 Choose dynamic re-indexing, to update your index every time your file changes. Or, mix and match your indexing options: choose fixed indexing with dynamic re-indexing for files you use every day, or portable indexing without re-indexing for files on a CD-ROM. Or, save your search results, so you only have to run your search once. You can save a list of the files you found, generate a report with relevant quotations from each file, or even print out a copy of your folder structure so you can easily organize your system. Click the link right now to download File Search Assistant, and you can try all of our features, absolutely free, for a full 30 days.